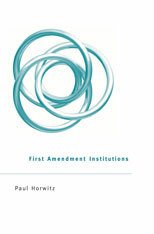 This November, Harvard University Press will publish First Amendment Institutions by Paul Horwitz (University of Alabama School of Law). The publisher’s description follows. Addressing a host of hot-button issues, from the barring of Christian student groups and military recruiters from law schools and universities to churches’ immunity from civil rights legislation in hiring and firing ministers, Paul Horwitz proposes a radical reformation of First Amendment law. Arguing that rigidly doctrinal approaches can’t account for messy, real-world situations, he suggests that the courts loosen their reins and let those institutions with a stake in First Amendment freedoms do more of the work of enforcing them. Universities, the press, libraries, churches, and various other institutions and associations are a fundamental part of the infrastructure of public discourse. Rather than subject them to ill-fitting, top-down rules and legal categories, courts should make them partners in shaping public discourse and First Amendment law, giving these institutions substantial autonomy to regulate their own affairs. Self-regulation and public criticism should be the key restraints on these institutions, not judicial fiat. Horwitz suggests that this approach would help the law enhance the contribution of our “First Amendment institutions” to social and political life. It would also move us toward a conception of the state as a participating member of our social framework, rather than a reigning and often overbearing sovereign. First Amendment Institutions offers a new vantage point from which to evaluate ongoing debates over topics ranging from campaign finance reform to campus hate speech and affirmative action in higher education. This book promises to promote—and provoke—important new discussions about the shape and future of the First Amendment.